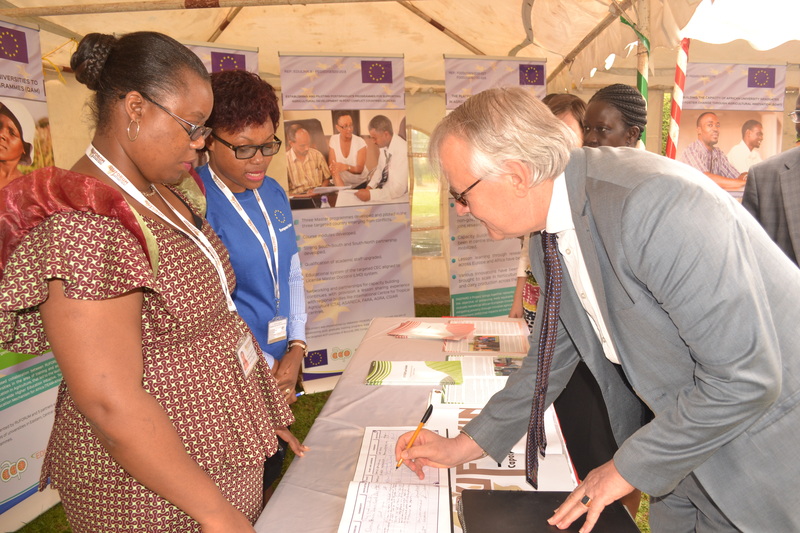 Head of Cooperation at the EU, Mr. Theo Hoorntje (Right) at the RUFORUM tent during the exhibition attended to by Mrs. Uwituze Solange and Mrs. Mkandawire Sylvia (left) from the RUFORUM Secretariat. The European Union recognizes knowledge and innovations as key ingredients for economic and social development. At a recent visibility event held at Makerere University in Uganda, Mr. Theo Hoorntje, Head of Cooperation at the European Union delegation to Uganda, pledged support to higher education through academic mobility between countries in Africa, the Caribbean and the Pacific regions including exchange programmes with academic institutions in Europe. This event, reinforced the Regional Universities Forum for Capacity Building in Agriculture (RUFORUM)’s role as a dynamic regional platform fostering collaboration, coordination and learning amongst its member universities. Through the exhibition, various European Union funded projects showcased their interventions in the areas of institutional capacity building, innovative and collaborative graduate mentorships programs, enhanced research linked to farmer needs and universities working with communities to address development issues. “International mobility of students is the most widespread and powerful vehicle for internationalisation for higher education, and more and more students are willing to gain international experiences” said Mr. Hoorntje while addressing the audience. In its strategy, the European Union recognises the importance of people – to – people contact. “Students and staff mobility is at the heart of the European Union higher education programmes, which help universities set up partnerships to manage mobility, and provide scholarships such as under the Intra-ACP Academic Mobility Scheme and the Erasmus+”. Mr. Hoorntje. Since 2004, more than 100 Ugandan students and staff have benefited from the Erasmus Mundus program to undertake masters and PhD studies or to teach, benefiting from full scholarships. The scholarships help to develop a highly–trained academic pool with international experience benefiting from the high quality courses and professional skills. At the event, Ms. Lorenza Gambacorta, the Programme Manager Education, Audiovisual and Culture Executive Agency of the European Commission from Brussels made a public presentation about the Erasmus+ opportunities available for Africa. The Intra-ACP Academic Mobility Scheme offer scholarships for students and academics from Uganda to carry out studies, research or teaching in another African country. Erasmus+ offer scholarships to carry out studies at a range of academic levels in European universities. One can study for a part of their degree in Europe or follow an entire degree in Europe (http://ec.europa.eu/programmes/erasmus-plus/discover/index_en.htm). The International Centre of Insect Physiology and Ecology (icipe), Kenya, in partnership with the German Academic Exchange Service (DAAD) In-Country/In-Region Scholarships Programme and African university partners, requests applications for doctoral research scholarships in the African Regional Postgraduate Programme in Insect Sciences (ARPPIS). icipe is an international scientific research institute, headquartered in Nairobi, Kenya that works towards improving lives and livelihoods of people in Africa. The centre’s main objective is to research and develop alternative and environmentally-friendly pest and vector management strategies that are effective, selective, non-polluting, non-resistance inducing, and which are affordable to resource-limited rural and urban communities. icipe‘s mandate also extends to the conservation and use of the rich insect biodiversity found in Africa. icipe works in a holistic and integrated approach through a 4-H paradigm – Human, Animal, Plant and Environmental Health – with the aim of improving the overall health of communities in tropical Africa by addressing the interlinked problems of poverty, poor health, low agricultural productivity and degradation of the environment (for more information go to http://www.icipe.org). DAAD is the German national agency for the support of international academic cooperation, and offers programs and funding for students, faculty, researchers and others in higher education. They also represent the German higher education system abroad, promoting Germany as an academic and research destination, and help build links between institutions around the world (for more information go to http://nairobi.daad.de/en/). Capacity building of individual researchers and institutions in Africa is an integral part of icipe’s research and development activities. icipe‘s Capacity Building Programme aims to promote the development and use of sustainable arthropod management technologies by enhancing the research and training capabilities of countries in Africa. ARPPIS is a partnership with African universities – with financial support from DAAD – offering three-year doctoral research scholarships aimed at preparing young researchers from Africa for regional leadership roles, as well as internationally competitive research careers, in arthropod-related sciences. At icipe ARPPIS scholars are provided with excellent research conditions in an interdisciplinary environment within a structured, three-year training programme that includes research, training, and participation in scientific meetings and international conferences. Scholars conduct their research at icipe’s laboratories and field sites located in various agro-ecological zones. Twelve DAAD-ARPPIS PhD scholarships are available in 2015. Scholarships cover all costs of the PhD programme, including travel, living expenses, medical insurance, university fees, and research and training costs. Financial support for the scholarships is provided in part by DAAD and also by icipe. Successful candidates will carry out their research in selected projects at icipe (see Annex 1 for a list of Eligible Projects and specific applicant requirements). The PhD programme will commence in September 2015. African University Deans and Principals (60) of Agriculture and related faculties will come together 8-10 June, 2015 in Khartoum, Sudan for a three day retreat to discuss issues related to strengthening higher education, Science technology and innovation in Africa. A key issue to be discussed by the Academic heads will be how to enhance regional science partnerships to strengthen higher education. They will also discuss opportunities for responding to the upcoming Call for the World Bank IDA supported African Higher Education Centers of Excellence (ACE) Initiative. 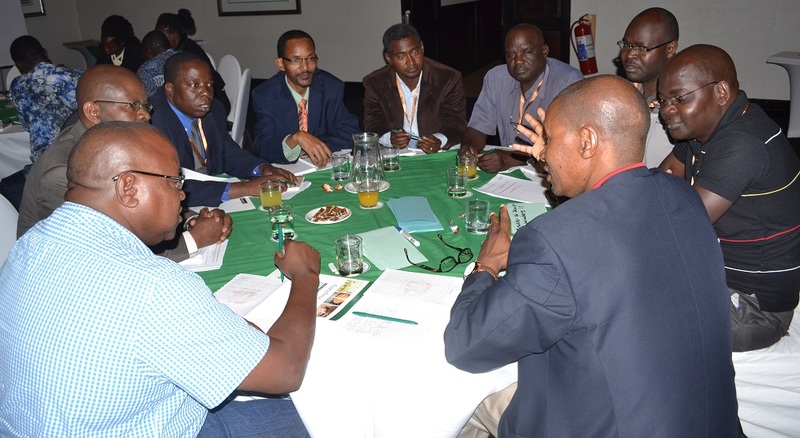 The meeting is being organized under the auspices of the RUFORUM Network. The hosts are the Universities of Gezira and Kordofan in collaboration with the Government of Sudan. Both University of Gezira and Kordofan University are member universities of RUFORUM. This is the first Deans/ Principals meeting this year, with a further meeting planned for August, 2015 in Windhoek, Namibia at the time of RUFORUM’s Annual General Meeting. The meeting will provide opportunity for universities to provide further input into the development of the RUFORUM Strategic Business Plan (2015-2020) that is expected to be approved by Vice chancellors of the 46 universities in Windhoek. The Plan represents an evolutionary step for RUFORUM following ten year celebrations, marked at the 4th Biennial Conference held July 21-25 in Maputo, Mozambique. The Deans and Principals play an important role in implementing the mission of RUFORUM particularly to monitor student performance and innovations to enhance quality of training programs. 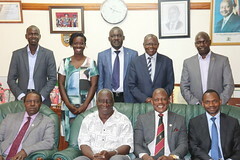 The Deans/ Principals Committee makes up one of seven organs of the RUFORUM network.